My Recent Catches – Little and Large! Phew! It’s been hot, humid and very sweaty out on the coastline recently – and that’s at night! What a Summer it’s turning out to be, and although it is hard going by day in these hot, flat calm and clear sea conditions some small bass have been caught. However, it is at night that these awesome predators have been feeding in earnest. Alongside numerous successful guiding sessions I have completed (including the taster ‘3 Day Packages’) plus Family and writing commitments, my previous solo fishing session actually occurred on the 6th June! Therefore, even though there was a risk of a thunderstorm, on the 30th June I embarked on a short session, from a shingle beach leading down onto reef and then pure sand, well into the ebbing tide. Attaching on the brilliant needlefish, my plan was to seek out a couple of adjacent, yet narrow coves, just to see if there were any bass in there – something I hadn’t tried on this mark before. Within 10 minutes of it becoming dark, I received a hit at range that turned out to a small (1lb) bass. A further 20 minutes later, I followed this up with a bigger one of around 2lb from the second cove, that happens to boast a rather tasty looking and even narrower gully running at 90 degrees to the shoreline (where the bass was laying in wait). I was supposed to be guiding the following evening/night, but with a Severe Weather Warning for thunderstorms issued my clients decided it was too risky to make the journey down from North Devon – you know what happened next and I still feel bad about it! Late into the evening and with not even a hit of a cloud (let alone a storm) I decided to head out on my own again. It was absolutely stifling out there, and the sweat was dripping off me as I climbed down the path and onto the rocks in order to fish a headland (of sorts) with a small surface lure over dusk. Clearly, there were a lot of small bass enjoying the heat judging by the amount of swirls and hits I received on the Bear King Slim Skimmer whereby I managed to land two spikey schoolies. I do like these small ‘sliding’ surface lures. They closely resemble a certain IMA lure but they work just as well (at a slightly lower price too). It’s always a thrill to catch bass ‘off the top’ and even though they were small it was still great fun all the same. With dusk now becoming darkness I settled down onto the shingle of a nearby favourite beach for a well-earned drink – waiting for it to become dark enough for me launch a pearl coloured Albie Snax here out into the 4ft of water covering my usual ‘reef with a particular feature set amongst it’ – this time a deeper 4m² pool. With high tide occurring at 2055 (a 4.8m Salcombe Scale) and darkness around 2212 it wasn’t until 2 hours into the ebb that, upon adjusting the angle of the cast (more up-tide and beyond the pool so to retrieve the lure back over it) that I felt a really solid take – they’d arrived! On occasion, it can be very difficult to ascertain the size of a bass when they’re battling away out there – and this one had me thinking it was much bigger. Boy can they scrap! At 50cm (around 3lb) this one scrapped like a 5 pounder! Note the ‘beastie’ flying around my head – it was like something out of ‘I’m a celebrity, get me out of here!’ when the lights went on! At 2 hours and 45 minutes into the ebb, and just as I was beginning to become concerned that the water was too shallow for the Needlefish that I’d subsequently attached (after it went a little too quiet for my liking) I felt very faint ‘tap’ reverberate through the braid/rod followed by an instant and all-might WALLOP! This bass turned and attempted to head out to sea, turned again, shook its head and then commenced what is becoming the customary bid to shake the hooks by swimming strongly towards me. A chunky fish that fought ‘like stink’ in the exceptionally warm water. Apologies for the ‘sand on its tail’ but returning them quickly is far more important than the perfect photograph. With the bass evidently feeding hard around this particular stretch, I couldn’t resist another couple of short forays over the next few nights. But with only smaller and less bass showing, as the barometric pressure increased and the water became oily calm I decided on an alternative area for the two guided sessions I was to complete on the Thursday and Friday evenings/nights respectively (more on those sessions including a person best 68cm for my client Mark in the coming days). 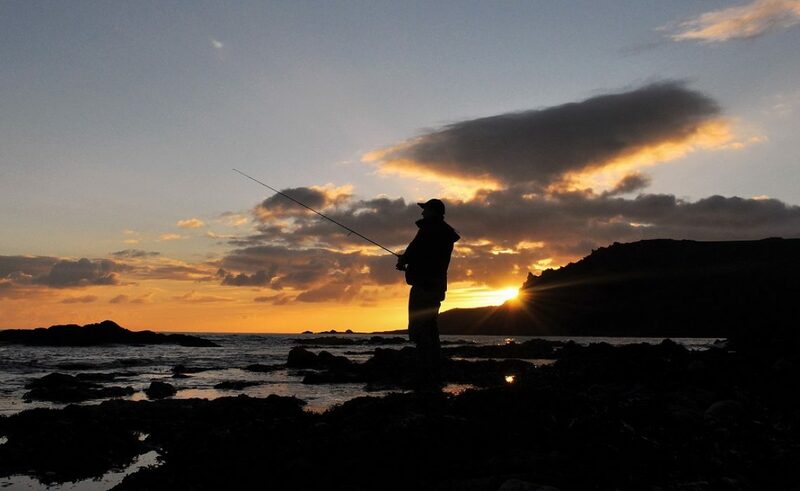 A client enjoying the gorgeous weather (and bass fishing) along this wonderful part of the UK coastline. It wasn’t until the 16 July (following a 4 hour guided session in daylight in which my clients caught a small bass and lost another) that I had the opportunity to fish again. Trawling my diary entries – there was a mark, tide time and tide height that had me very excited. So with the air pressure having decreased by 7Mb in the previous 12 hours (something that can be significant) I headed out full of optimism (dangerous I know!). Now the mark I was fishing can be remarkably ‘consistent’. And when I say consistent I mean the bass can appear literally to the minute – but only on a very large spring tide, that is ebbing in calm to slightly lumpy sea conditions. Timing my arrival to coincide with the turn of the 5.3m tide (peaking at 2137) I set about casting and retrieving the needlefish whilst moving along the venue as a light and very welcome breeze enveloped me. Two hours into the ebb (and with my back starting to ache) I was just adjusting myself into the shingle and stretching whist retrieving when the rod whacked downwards – even when you’re expecting a hit it still startles you! This fish hit me close in (within 15m and just on the edge of a known underwater gully) and although it didn’t feel huge, I could immediately feel it grinding on the flat rocks positioned under only 12″ of water. 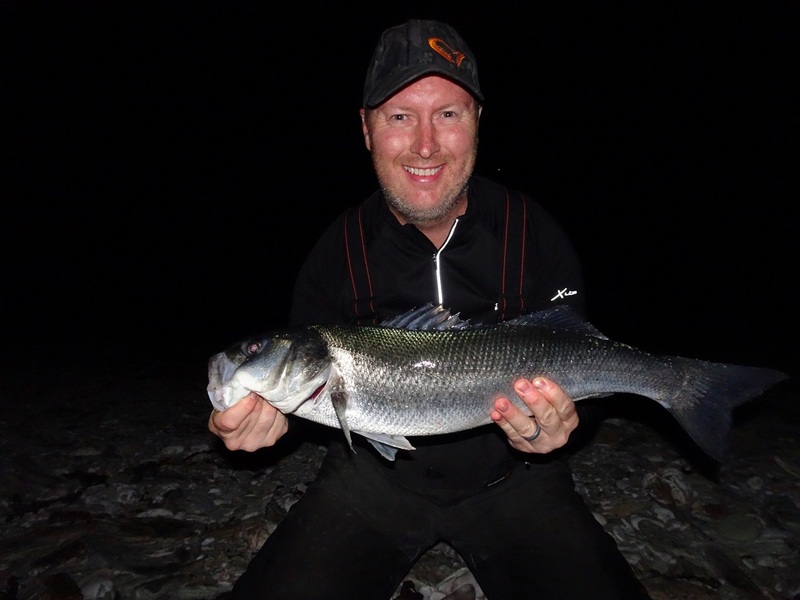 A bass of around 2½lb that grabbed a needlefish just as the ‘witching hour’ approached. I was happy that I’d caught one, but in the back of my mind was the possibility of a ‘whopper’ from this mark! But if it didn’t occur within the next 20 minutes the water would be too shallow for even the bass! 5 minutes passed, then 10, then 15… Was it going to happen? Risking one of my prize needlefish, just as I entered into what was the final 5 minutes, and only 10 turns of the handle into the retrieve, the rod went solid (as if I was snagged) and then started bouncing and bucking wildly as a fish began to tear line from the (lightened) drag – here we go! Remembering the harsh lessons I’ve endured (when I’ve perhaps had the drag set too tight in darkness) and now with 21lb Savage Gear soft fluorocarbon leader here attached (rather than the 16lb I was using last season) I grudgingly allowed the fish to take a 5 or 6m of line as yet again, I felt it bumping along the reef – heart in mouth stuff, but bloody exhilarating too! I heard it splash a long way out in the blackness (an encouraging sign following this very spirited run) and with the rod held high I began to work the fish closer to the beach. With a further run out to sea tempered by a quick tighten of the drag, the fish once again splashed slowly on the surface, and I took this brief interlude to switch on my headtorch – but I couldn’t see the fish. Rhythmically thumping and shaking its head (a great feeling through these light lure rods) I maintained constant pressure as I gently lowered the rod slightly – so not too apply too much tension on the hook hold. Just then, I saw the mouth, back and dorsal thin break the surface around 7-8m out. It looked like a good one therefore, I did all I possibly could to just bring her gently but firmly in with, what were by now small waves breaking over the reef, until she reached the shingle – whereby I grabbed the leader and led her a couple of feet up the wet pebbles. You beauty! The one I wanted! Measuring 67cm (7lb+) this pristine bass was unlikely to escape given the hook hold, but you don’t know that until they are safely on the beach! She looked beautiful in the flesh and despite the incessant flies buzzing around my face I couldn’t but admire how stunning this fish was. And at 67cm, it is the largest bass I’ve caught this year (I’ve been outdone by clients who have already landed 68, 69 and 70cm bass so far this season). I will never, ever, tire of, or take for granted catching these amazing fish – every single one of them is special to me. What has pleased me over these solo sessions is not only that new marks have produced but that consistent marks have also yielded bass when I thought they might. Furthermore, of greater significance is the variation in the size of the bass caught, which suggests there could have been a succession of strong spawning year groups in which the bass have been able to grow and re-populate – great news for the future we all hope. Next Client Catches – A dream come true! Thank you for the kind comment and very well done on your catches – the first of many I’m sure.